Goalsystem is over on sale over on Wargamedownloads.com. Go get yourself a copy. Goalsystem rules from Scott Pyle are on sale for 20% OFF, this Friday (11/30/12) at wargamedownloads.com No codes needed. 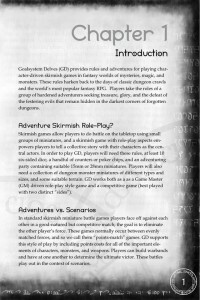 Goalsystem Delves now has their game rules PDF available over at Wargamedownloads. Go check it out. 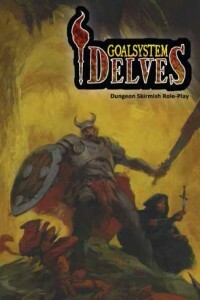 Goalsystem Delves provides rules and adventures for playing character-driven skirmish games in fantasy worlds of mysteries, magic, and monsters. These rules harken back to the days of classic dungeon crawls and the world’s most popular fantasy RPG. Players take the roles of a group of hardened adventurers seeking treasure, glory, and the defeat of the festering evils that remain hidden in the darkest corners of forgotten dungeons. Goalsystem Delves seamlessly blends RPG and tabletop miniature elements into a fast paced tabletop experience that provides the depth of an RPG with the fast paced action of a tactical miniatures game. Delves plays fast, allowing players to run a multi-encounter Adventure in a single session and epic campaigns over multiple sessions. Using the proven and popular Goalsystem, Delves delivers character driven action that’s deep enough for RPG gamers and fast enough for miniature gamers. Four Color Studios wanted it to be known that they're working on Ghosts of Hefei, a Goalsystem expansion to The Department. The Four Color Studios team is very pleased to announce the development of Ghosts of Hefei, the newest Goalsystem book and sequel to The Department: Noir Investigation Skirmish. 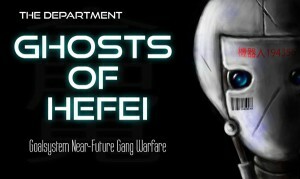 Ghost of Hefei is a skirmish game set in near-future China. Players control a handful of figures, fighting each other to steal fabricants (humanoid robot workers) from the heart of China's industrial might. Ghosts of Hefei is fully compatible with The Department, and will allow players to pit criminal gangs from Hefei against agents of the People's Beureau of Fabricants. The game will feature a 28mm miniatures line, but will also include rules for 15mm play. We'll be launching a Kickstarter drive to fund the development of the rules and miniatures in a week, but we wanted to give you a chance to look at the website and see what the game is all about. 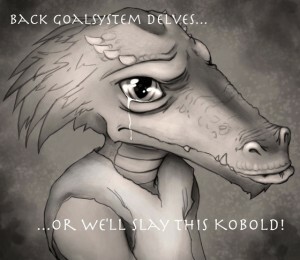 Considering the amount of kobolds that generally are slain in a game, what's one more? But you should still consider backing, anyway. Goalsystem Delves designer Scott Pyle discusses his favorite character class and shares some of the design elements. Goalsystem Delves has just 5 days left and $2k to go for funding. With that, they've got another update to get you interested in their cause. 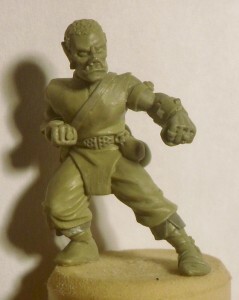 Be on your guard as the fifth Goalsystem Delves SE miniature has been revealed: the half-orc monk! This pugnacious pugilist is a fantastic delving companion, combining strong offensive and defensive elements. Sculpted by Andy "Soapy" Dormer, the half-orc monk figure combines the half-orc's savage nature, with the serene discipline of the fighting monks art. You can receive the half-orc monk individually at the $12 reward level, or with four other SE miniatures as a part of our backer reward packages at the $50, $85, and $100. You can also get him painted and ready to wreak havoc on the table as a part of our $300 backer reward package! 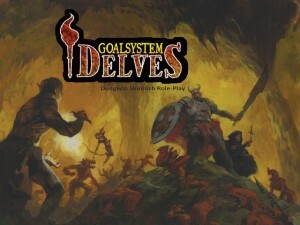 Goalsystem Delves is closing in on one week left in their campaign. They've got a little over $3k to go to make it. 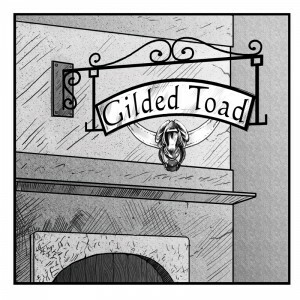 To entice you, they've put up a sample of part of Chapter 1. First, and foremost, thank you to everyone who has backed us so far! 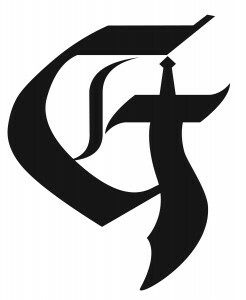 All of us on the Goalsystem Delves team are inspired by your faith in our product! We're fast approaching the end date of our Kickstarter and at 70%, we just need a little more help to get over the hump. Backers, please share your support with your friends. With your help we can make it! The Goalsystem Delves rules are currently in the layout stage, and as such, we thought it would be exciting to share a sample of the book from Chapter 1. This chapter covers the basics of Goalsystem Delves including the play area, measurement and scale, Goal Rolls, Target Numbers, and the Power of 6. We think you're gonna love it! Now get delving! Goalsystem is more than halfway there to their funding goal on Kickstarter. For their latest update, they wanted to show off the rules they've made for the time between adventures, while your heroes are just chilling. For this update, Delves looks at how characters sped their time between adventures. Goalsystem Delves is right at about $4k short of their goal with still 18 days left in the campaign, so plenty of time to make up the difference. To help out, they're showing off a new model, the Oni Mage. Based on Joshua Dahle's amazing illustration for the Goalsystem Delves rulebook, Four-Color Studios presents the 4th special edition miniature, the Oni Mage! Sculpter Tom Mason masterfully captures Dahle's imagery to create this imposing fantasy monster. In Goalsystem Delves the Oni Mage is a dangerous and canny foe, capable in both melee and at range with it's magical abilities. This frightening foe also features prominently in one of the three adventures featured in the Goalsystem Delves rulebook. You can receive the Oni Mage and four other SE miniatures as a part of our $50 and $100 reward levels, and you can get him fully painted as a part of our $300 and $500 reward levels! Goalsystem is a little more than halfway to their funding goal with still 27 days to go in their campaign. They've put up another incentive for you to help them make it the rest of the way. A fully painted Caverns of Blood 64 piece dungeon terrain set can be yours at the $250, $285, and $500 dollar backer level, but what is the set really like. Enrico and Scott discuss the Caverns of Blood set in this update video! Goalsystem Delves has made it about halfway up to their target goal on Kickstarter. For more impetus to help out, they're showing off the new Clawed Stalker. 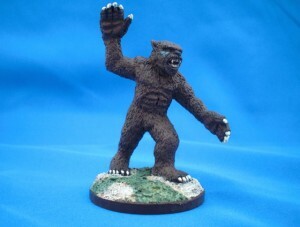 Our third SE miniature for the Kickstarter is one of two "large" size figures: the Clawed Stalker! A clawed stalker is the result of a druid giving completely into his/her atavistic nature. Over time the druid grows, its size only matched by its hatred, unleashing violence on any creature that happens to stumble into its territory. These malicious monsters have been known to track parties of adventurers for days, gleefully picking off those who stray too far from the light or the protection of their fellows. The clawed stalker stands about 50 mm from base of foot to tip of ear and will surely intimidate any party it encounters. This figure was sculpted by Chip Mann and painted by Scott Pyle. You can get your paws on the clawed stalker figure, as well as four others (two yet to be revealed) by pledging at the $50 or $100 level, and you can get them fully painted as a part of our $300 and $500 dollar pledge packages. Goalsystem Delves has the first update of their Kickstarter campaign and is showing off two of the exclusive models for the project: halfling adventurers. Here are pictures of the first two special edition miniatures on offer as a part of the Goalsystem Delves Kickstarter project: Two Halfling Adventurers! 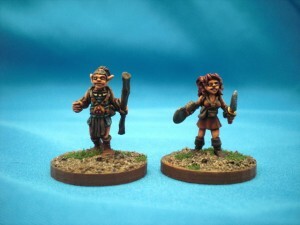 The Halfling adventurers were sculpted by industry veteran Bob Naismith and painted by Sky Hernstrom. These two high quality miniatures are cast in pewter and come with interchangeable hands so you can arm each as you would like. You can get your hands on these two figures, as well as three more yet to be revealed by pledging at the $50 or $100 level, and you can get them fully painted as a part of our $300 and $500 dollar pledge packages. Goalsystem Delves is a new project up on Kickstarter. It's sort of a blend of old-fashioned RPG games with minis skirmish games. Check it out. With just two days to go, we have shot past our funding goal. I'd like to extend my sincere thanks to everyone who has already pledged and helped make this game a reality. If you haven't pledged yet, now is time to get in on the action. Many of our rewards are available only to Kickstarter backers so if you want a t-shirt or a signed poster, consider backing the project. Many thank to our backers and the wargaming community as a whole. You have shown that crowd funding can work for miniature wargaming projects. With just three days left on the Kickstarter drive, we are tantalizingly close to our goal. We only need 16 more backers at the $50 level to fully fund the project. We've raised almost $3000 so far if our goal of $3800 and pledges keep coming in. Now is your chance to get exclusive rewards for Kickstarter backers, such as t-shirts, posters and the chance to have your face drawn into the game art. In addition, the development team and I will be handwriting and signing a personal thank you to our backers in every book purchased through Kickstarter. By backing the project you will receive a unique product that you helped create. The Kickstarter drive is entering its final week. We've raised over $2000 for the game so far. A big thanks to everyone who has already pledged, but we still need more pledges to reach our funding goal. Kickstarter uses all or nothing funding, so if we fail to make our funding goal, no money changes hands and the game will not be produced. We've got a lot of great rewards such as T-shirts and posters, not to mention signed, numbered copies of the rules. Our lead illustrator, Dave Powell will even draw your face into the final game artwork. All backers will be acknowledged in the rules. So if you like Goalsystem or investigation gaming, consider backing the project. I'd like to announce The Department Facebook contest. All you have to do is like our Facebook page. That's it. We'll select one person to receive a free signed print edition of the game. Three other lucky people will receive a free PDF, or, eBook version of the game. 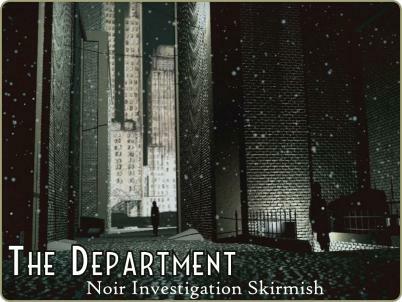 You can also find The Department on our Kickstarter page. Four Color Figures has posted an example of play on The Department official website. The Department can also be found on Kickstarter. The Department is a tabletop miniature game set in a near future America where Fabricated Human Simulants, also known as fabricants, walk among us. Players take on the role of agents from the U.S. Department of Fabricant Management, a government department charged with policing fabricants and fighting the increasing instances of fabricant-related terrorism. 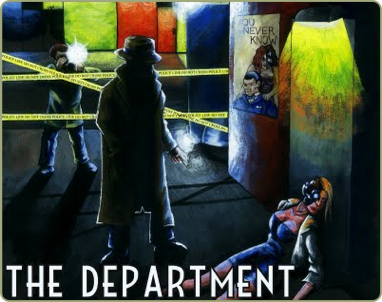 The Department is meant to be the first tabletop police procedural game that requires no Game Master to play. Powered by Goalsystem, the game draws heavily on the noir and police procedural dramas and blends in elements of robotic sci-fi. The Department will be an approximately 150 page full color soft cover A4 sized book chock full of art, fiction, and a complete ruleset ready to play straight away. We’re raising Kickstarter funding to cover our creative costs and an initial print run. We will also be producing a full color PDF as well as a kindle, ebook, and a printer-friendly Pdf version. Scott Pyle's range of "GoalSystem" games are now available for instant purchase and download from the 6sided download store. Purchasing through the 6sided.net download store earns us enough commission to continue to grow our blog networks features and server power. We are always looking for quality digital rules/RPG's etc to offer through the download store, so if you have rules you would like to add to the store, please visit this page. We also offer 20% commission for our affiliates per referred sale. To become an affiliate visit this page: And finally, if you are thinking of starting a blog, or have a blog elsewhere you would like to import to take advantage of our powerful blog features, you can find out more on our homepage. Just a note letting folks know I am currently working on and play-testing the next GS rules release, Blaster & Bulkheads. This will be Space Opera with all of the familiar trimmings. Weird mysticism and powers. Energy blades. Robots. Aliens. Blasters. Vehicles. The game will include a full campaign system, sample scenarios, teams, and creatures. Good for 15mm or 28mm. Blue Moon will be doing specific 15mm figures to support it, but it will contain a full build system and be usable with any other line of figures. Hope to have it completed by end of summer. Form a warband and adventure through Bronze Age Greece in a world where living myths walk among men. 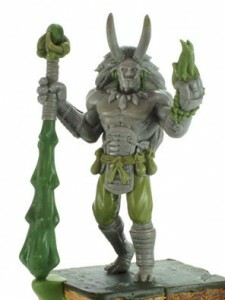 Build Demi-Gods, Satyrs, Centaurs, Amazons, and more. Battle your opponents' warband and the cursed children of the fallen Titans to recover ancient knowledge and gain the favor of the Gods themselves. 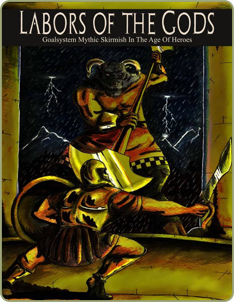 Featuring skirmish-level action designed for 15mm or 28mm miniatures from any manufacturer, Labors of the Gods utilizes the tried and tested Goalsystem game engine made popular in previous releases like SuperSystem, Chaos in Carpathia, and Chaos in Cairo. Labors requires only a handful of miniatures and fistful of six-sided dice to play, and includes a full campaign system and five pre-made scenarios to get players right into the action. Clash with titanic foes and undertake legendary journeys on the tabletop with Labors of the Gods.